CLEAN TITLE CERTIFIED! 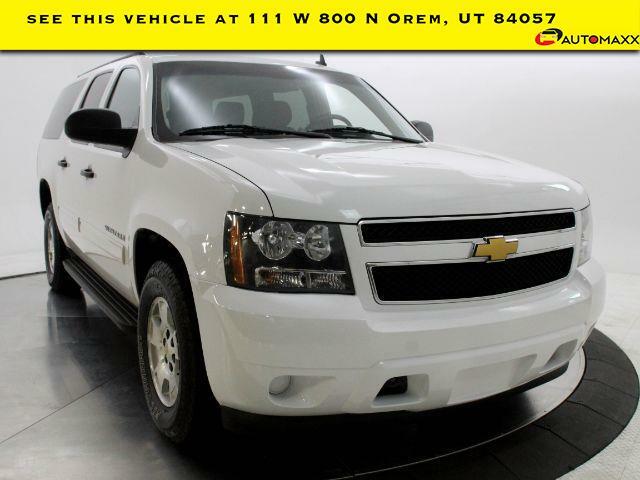 This vehicle is at 111 W. 800 N. Orem, UT 84057. Reviews: * The 2014 Suburban is good at hauling people and stuff, delivers a quality ride and is surprisingly agile for its size. A loaded LTZ is nearly Cadillac-plush. Source: KBB.com * Seats up to nine people; class-leading cargo capacity; lots of standard and optional features; comfortable ride; smooth V8 engine. Source: Edmunds * The Chevrolet Suburban traces its roots to 1935, and 79 years later, this full-size SUV proudly claims its status as the oldest continuous nameplate in automotive history. The biggest update for 2014 is the Convenience Package is now standard, which includes power-adjustable pedals, remote start, rear parking assist, and a backup camera. The Suburban has long earned its stripes as an SUV that can carry lots of people and haul lots of stuff. The 2014 Chevy Suburban continues that mission while offering a rugged image and many creature comforts. Source: The Manufacturer Summary 2014 Chevrolet Suburban 1500 LS Awards: * JD Power Initial Quality Study * 2014 KBB.com Brand Image Awards --- All vehicles come with a 12 month/12,000 mile Powertrain WARRANTY for your PEACE of MIND! --- www.utahautomaxx.com --- 801-224-5333 Se Habla Espanol.